Saturday 16th March was a pleasant Saturday, there was a little matter of who would win the 6 nations championship, could England beat Wales to secure the Grand Slam or could Wales successfully defend their title, not being biased, but the outcome of that game was always only going to go one way, however the preceding hours were a little less certain. The Lambeth Green Streets project had another community event, Sustrans were putting forward the preferred design option for final comment from residents, will tensions be high?, will they like the proposals?, what have we missed?, what will be the outcome? Have we addressed the parking issues? I have always been very clear that for this project I want to collect as much base line evidence as possible, we started with a parking survey. A parking survey is a very straightforward survey, it basically measures the availability of parking in any given location and measures what is actually using the available parking spaces over a few days and at different intervals. We then commissioned an Automatic Traffic Count (ATC) so we can understand traffic volumes, classifications and speeds, given both roads are within a 20mph zone. Although the ATC will give many different measures, the most useful for this project was the 85th percentile, this is “the speed at or below which 85 percent of vehicles travel” this would help define if there were any particular road safety concerns. Alongside these surveys we undertook a topographical survey to ensure we understand the levels and location of ironwork etc this was supported by a statutory undertakers search for their apparatus in both Chatsworth and Ardlui. We commissioned Steve Wilson from EPG to undertake the designs of the rain gardens, however again I was clear that I wanted an evidence base, as this was the first time within Lambeth we were going to engage with residents about installing rain gardens, so URS were commissioned to undertake modelling of the original designed rain gardens. The modelling was undertaken on the basis of the topography, drainage network for both Ardlui and Chatsworth. In recent presentations I have given I had indicated and shown hydrographs highlighting a significant benefit for the introduction of a rain garden in Chatsworth, these claims were unfortunately overstated and I apologise for this. However the final modelling report still highlights, I feel, excellent benefits, these are highlighted in the modelling report (soon to be added to the susdrain case studies). I have been quite open about the level of reduction I feel that is sensibly achievable through the introduction of SuDS and GI in Lambeth at 5%, although due to the combined sewer network and often over complicated drainage network actually measuring 5% reduction would be difficult but is still felt to be a realistic and sensible target. There are clear benefits, not just for surface water management but also for traffic calming of installing rain gardens in both Chatsworth and Ardlui. Alongside this there are the added benefits of creating space and place which is not dominated by a single mode of transport. 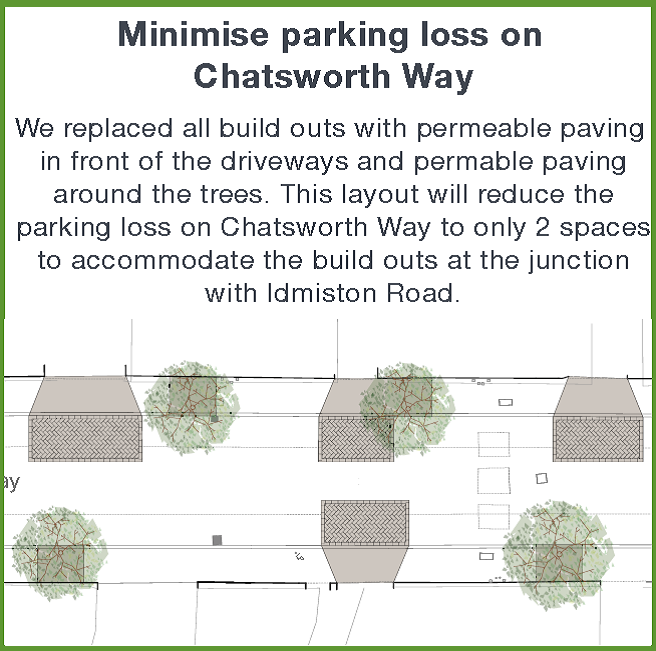 It is clear that now through the community engagement process we have gone through with Sustrans and residents the original rain garden designs undertaken by Steve have significantly changed we will not be putting in rain gardens in Chatsworth Way as residents do not want to lose any parking regardless of the parking surveys undertaken, though we will be implementing permeable paving at the dropped kerbs as shown in the diagram below, part of the design deliberately extends the permeable paving into the road past the parking line, this is to give a visual deflection to passing traffic giving the illusion that the road is narrower due to the different materials of the permeable paving and asphalt. The rain gardens in Ardlui are very different from the original design though we are confident we will achieve the same, if not better performance for the preferred designs. So how did the day finish? 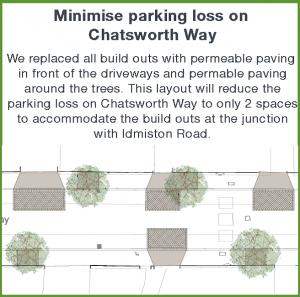 Well there were still the questions of lost parking, however residents are happy with the designs put forward, we are now looking forward to the 11th May where Chatsworth will be closed so we can trial the designs with straw bales, cones and barriers and really test opinion. As for the little matter of the 6 nations championship was there ever any doubt.